Check out the latest video from Rock Your 4×4! The video highlights just a few of the many trails at Windrock Park only 45 minutes from our hometown of Knoxville, TN. It was a great day and the little bit of snow we encountered made it even better. Enjoy the show here. A new hot item we’ve sold quite a few of lately is the Warn Zeon 10-S. The new winch design includes a removable control pack for more mounting options than the previous styles. The winch has a larger motor and planetary than previous designs. It also has an aluminum drum to dissipate heat better for the included synthetic rope. 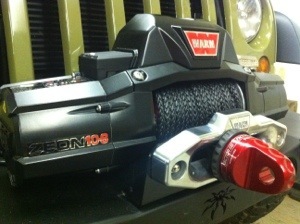 Warn also supplies a nice polished aluminum fairlead with the winch. Check out the pictures below and check out Warn’s site for more details.